Résumé (extraits sélectionnés) : Juan Pablo est un journaliste indépendant et documentariste argentin, qui est en visite au Canada depuis quelques mois. [...] En visite à Montréal la plupart du temps, il s'est rendu comme de nombreux résidentEs du Canada à Toronto en juin dernier pour documenter le mouvement d'opposition au G20, publiant notamment dans les médias alternatifs en ligne cmaq.net et 2010.mediacoop.ca. « C'est incroyable qu'on refuse la libération de Juan, puisque chaque jour le système judiciaire canadien libère avant leur procès des gens accusés de crimes autrement plus graves. On comprends que si on est pauvre, et qu'on ne peut pas offrir de garantie matérielle, on a pas les mêmes droits » annonce Marie-Eve Blais, une des membres du comité des ami-e-s de Juan qui s'est constitué depuis son arrestation. 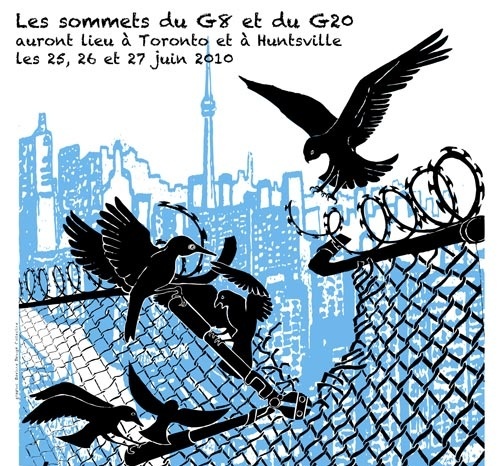 Sounds and music recorded during the G20 protests in Toronto in June 2010. Repressive forces deliberately targeted those dressed in black. The media, also seemingly concerned with anarchist dress-codes, broadcast, over and over, images of supposed “young thugs” and focused their analyses on the now famous Black Bloc tactics. This kind of media coverage gives the impression that the acts in the streets of Toronto were void of political content and that anarchists are scary individuals who should be placed behind bars for the protection of all. Le show It’s the end of the world as we know it (and I feel fine) est produit par submedia.tv et son Stimulateur à peu près aux deux semaines. C’est une émission franchement insurrectionnelle. Rare en ostie pour un show de tv ! En tant que membres du Collectif de recherche sur l’autonomie collective (CRAC), nous joignons notre voix à celles des nombreux groupes et individus qui ont vigoureusement dénoncé la violence étatique et la répression policière sans précédent auxquelles nous avons assisté lors du Sommet du G20 à Toronto. Ces violences ont affecté nos ami.es, nos collègues, nos camarades, nos partenaires, nos communautés. Par la même voix, nous tenons également à dénoncer les discours sensationnalistes et désinformés qui ont surgi dans les médias à l'occasion de ces événements. Precisemos que el marxismo ortodoxo siempre ha rechazado al terrorismo y las intrigas políticas que no tienen absolutamente nada que ver con el derrotismo revolucionario y la guerra de clases: ya sea la propaganda de “la acción directa” de los sindicalistas revolucionarios del siglo XIX, el bandidaje anarquista, o las manipulaciones bakuninistas en el seno de la Primera Internacional. Concerning Potential Infiltration in Canada: "Khalid M."
so-called Khalid claimed to be 35, hailing originally from Kenya, and had a basically unlived-in apartmentin Guelph. he infiltrated or tried to infiltrate numerous actions and groups over his time in the region. He appeared at the Hanlon Creek Business Park land protection in the summer of 2009 but was not trusted by the entire camp, and he was eventually blocked from the site through the identification of a need offsite for a "dedicated" person. From April 2009 until July 2010, two undercover police officers infiltrated activist groups in Guelph, Kitchener and Toronto, Ontario. They are members of the “Joint Intelligence Group (JIG)” that focuses on extremism and terrorism. Its specific mandate has been for the Vancouver Olympics and Torch Relay, and the G8/G20 summits. It is an RCMP (National Police) led group that includes police forces collaborating from across Southern Ontario including Guelph, Hamilton, Toronto, Ottawa, Barrie, Kitchener/Waterloo and the Ontario Provincial Police (OPP). The names the two undercover intelligence police officers used were “Brenda Dougherty” and “Khalid Mohammad”*. OPP seeks to silence alleged G20 protest ringleaders. July 29, Toronto – The OPP have warned two alleged G20 protest ringleaders, Leah Henderson and Alex Hundert, that their recent media interviews are a violation of bail conditions not to organize, participate or advise protests. On the morning of July 28, OPP officers called their sureties and threatened to re-jail them if they persist in speaking to the media. Leah and Alex were released on bail on Monday July 19, three weeks after they were arrested at gunpoint in a pre-emptive nighttime raid on their Toronto home.